CD review: "The Morning Way"
This review first appeared in the January 11, 2007 issue of the North County Times. Despite the incredible range of experimentation that has gone on in rock music since the 1960s, a violin in a rock band remains an oddity  Jefferson Airplane, Curved Air and ELO being among the few to pull it off as anything other than an oddity or a distraction. So give San Diego's Tefflon props for making Alicia Ruggiero's violin and viola as organic a part of the band as any of the other instruments. More so, actually: Ruggiero's rich but haunting string work provides a smokey underpinning for the band's entire sound. It is impossible to imagine the band's first album without her playing above and behind everything else that happens here. But nor would this be the same without Devin Swanson's subdued yet expressive vocals and tasteful guitar, nor Brian Cantrell's steady drumming. And the songs, of course. None of the above would be worth a penny if there wasn't some solid music to play. 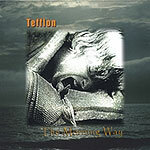 On this score, too, Tefflon has done well. The songs are credited to the band as a whole, so we'll give the entire band credit for 10 very good tunes. It's all in an acoustic folk-rock meets art-rock groove: not too far from early Jethro Tull or Fairport Convention. The production is stellar  no surprise, given that local recording wiz Jeff Berkley was at the console.